This is the 3rd stage from Saturn V vehicle SA-515 on display at the National Air & Space Museum on the National Mall in downtown Washington, DC. Vehicle SA-515 was built as a flight-ready Saturn V, but it was not assigned to an Apollo mission. It likely would have been in line to support Apollo 20. That mission was canceled before this rocket was completed. 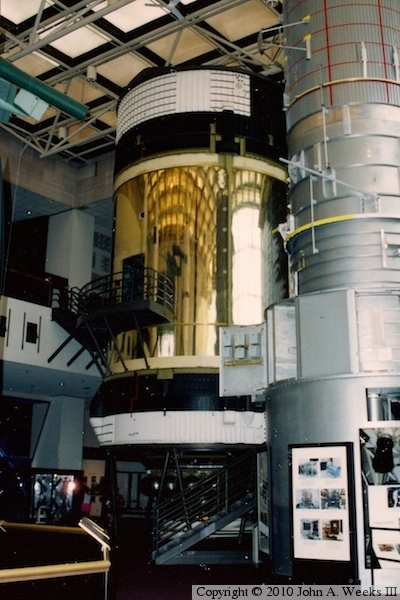 The third stage was converted into the backup Skylab space station. It would have been flown if the primary Skylab failed to reach orbit. Later, it was proposed to fly this as Skylab B in the mid-1970s. That mission did not go forward in order to use the money for the Space Shuttle. In the end, the backup Skylab ended up as a museum piece. The first and second stage were also slated to be used for the backup Skylab flight.